The PYP 3 students had a busy week before the start of the Christmas Break inquiring into the Respiratory system and the Circulatory System. To gain a clear understanding of the circulatory system, general practitioner Doctor Suganthi Kumaran, visited our class. Through a video followed by a well labelled diagram, Dr Kumaran explained the functionality and workings of this important system. The session provoked students to ask compelling questions which were answered patiently with further diagrams and discussions. 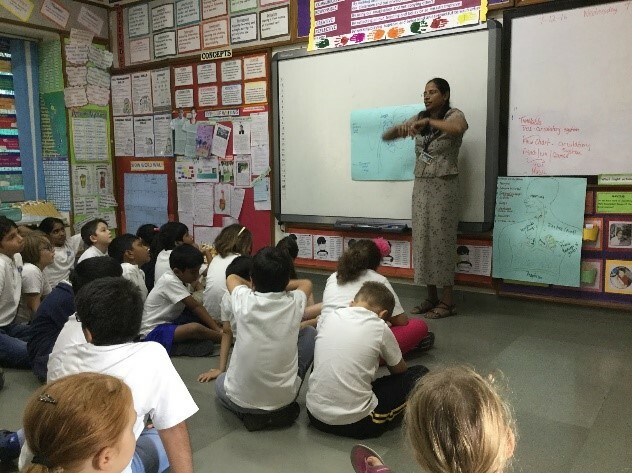 Dr Kumaran shared many facts relating to the circulatory system and students were introduced to scientific terms such as pulmonary artery/ vein, valves, atrium, ventricles and capillaries. The students were fascinated to discover how hard their heart has to work in order to maintain a continuous cyclic flow of blood in the body. Students then worked in pairs to create a sequential flow chart, to show the entire process, which further cleared their misconceptions. The PYP 3 students can now confidently share their knowledge of this system and understand the need to keep this system healthy by exercising, drinking water and making healthy food choices.